The AFL Grand Final may mark the end of a football season but it doesn’t mark the end of the football year. There is plenty of football, and plenty of scoreboard photo opportunities over the coming months in the Northern Territory. The photo above is from 1987. Michael Long, and many other fine footballers, hailed from Saint Marys. 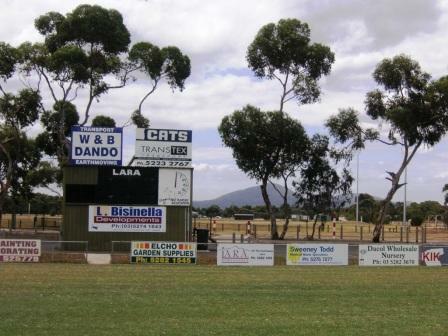 Until Geelong’s premiership victory this year Lara, a township outside Geelong, was probably best known – in footballing terms – for being the place where the team bus was supposed to pick up Garry Sidebottom en route to a preliminary final in the early 1980s. Now, though, the town can boast an AFL premiership player, in Allen Christensen. Allen was selection 40 in the 2009 NAB AFL Draft. He was recruited from Lara Football Club and the Geelong Falcons. In 2009 he represented Vic Country in the NAB AFL Under 18 Championships, was runner-up in the Morrish Medal and was named in the TAC Cup team of the year. In 2010, he played 16 games for Geelong’s VFL side and finished fourth in the best and fairest. He debuted in the seniors in round two this year. Allen is the nephew of former Cats Marty and Damien Christensen and is also a relative of the Long and Rioli families. Like Geelong Football Club, Lara are the Cats. They have won seven premierships, with the most recent, in 1994 and 2002, being in the district’s highest level of competition, the Geelong Football League. 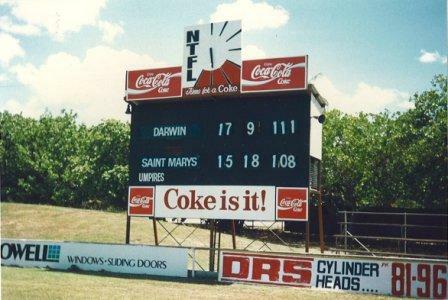 Scoreboard pressure has some 2011 Grand Final sentences on our Scoreboard quotes page, with utterances from the Channel Ten commentary team and also from an Albion player, whose team (also the Cats) lost the Grand Final to Spotswood. We have also added an archival photo of the inner-workings of the old MCG scoreboard to our Manuka page. And thanks to the Mortlock Recorder in WA and The Age in Victoria for recent articles and mentions about this website. 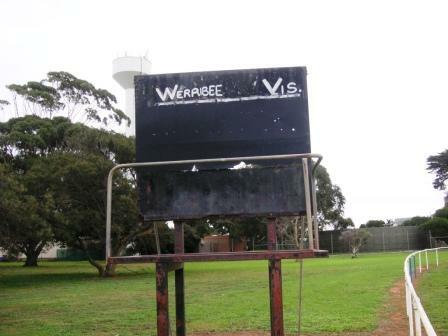 The scoreboard at Werribee South, a ground beside a caravan park and near the local market gardens. It’s not the fanciest scoreboard around but it has its own rustic charm.